Global Ambassador Sun Li tells us why living young is not a matter of age, but a state of mind. Enter a convenience store and you’ll spot it instantly: evian’s bottles, graced with pictures of celebrities and sport stars transforming into babies. Part of its Oversize campaign launch across Asia this year, evian seeks to brings to life a world in oversize, as seen through the eyes of a baby. This is the seventh edition of the company’s highly successful “Live young” campaign. In Asia, the brand launched its new spa at six-star hotel Signiel in Seoul, inspired by the purity of the Evian alps in France. The spa features authentic and highly sensorial materials, natural light reflections and breathtaking views. To date, the global evian “Live young” team comprises of international sports personalities Maria Sharapova, Stan Wawrinka, Lucas Pouille, Madison Keys and Lydia Ko. Famed Chinese actress Sun Li joined the campaign in June 2017, and we sat down with her to understand the importance of hydration and a healthy, balanced lifestyle. Doyenne: How did you and evian come to partner together for the Live Young/ Oversize campaign? 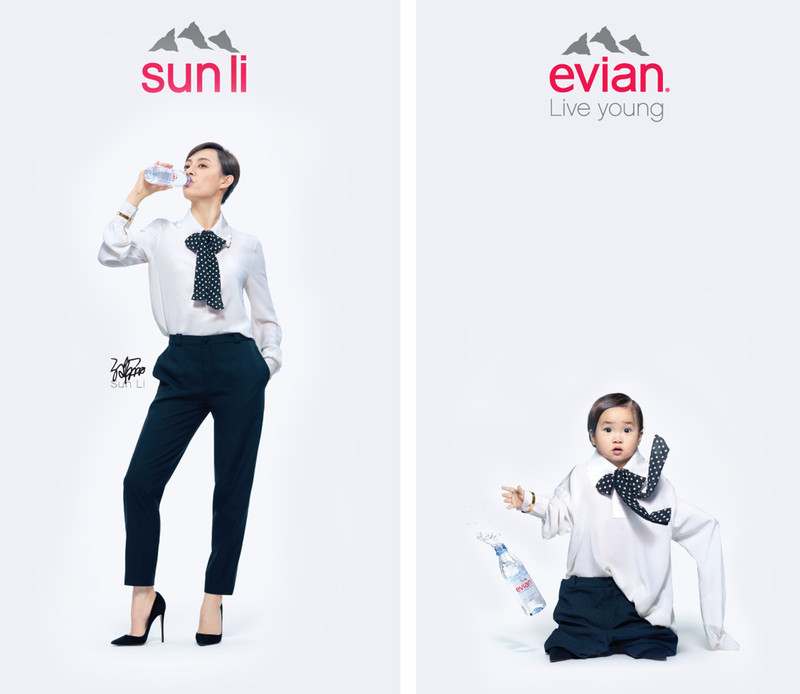 Sun Li: Actually, this is not my first time working with evian. We previously worked together in 2013. We went to Évian-les-Bains in France, located on the shores of Lake Geneva, on the north side of the Alps. The place is stunning with its natural beauty and sceneries. I feel that our attitude towards life is very similar and we generally veer towards things that are natural and pure. D: Was there a creative process involved? SL: I remembered coming across the commercial for the first time. I felt that the ad was very meaningful as it made me wonder what it was like to be a child again. For my video with evian, it is the same type of commercial and it was very fun to film. D: What is your Live Young philosophy? SL: I feel that your attitude towards life and the lifestyle you choose is very important. For example, being passionate about life and having a thirst for knowledge to learn, try out and experience new things is part of that. I love to draw, write, exercise and read Chinese medicine health books as I have a lot of friends who, like me, are very particular about eating clean and living well. I prefer a very structured life. When I am not filming, I will be up at 6am or 7am to exercise for at least half an hour. I sleep at around 9pm. No matter the lifestyle you choose, it is important to do things you want to do and feel comfortable doing. D: If you could turn back the clock to your younger days, when would you turn it back to? SL: Honestly, I feel like my life just started and at this stage, I can’t really imagine turning back to my younger days. [laughs] For me, no matter the age, I feel that the most important thing is to live in the now. We will have interesting memories and experiences at every phase of our life and when we look back, this is something we cannot replace. What we experience in the past makes us who we are today. SL: When I was young, my ambitions were very simple. All I wanted to be was a bus conductor. As I started getting involved in a lot of contests and advertisements, it seemed like destiny and I started to get involved in acting. Even now, I often wonder how I actually started getting involved in acting. It was almost like a dream. As I acted in more productions, I realized there is always room for improvements. The love for acting developed slowly over time as I studied each scenario, each character, each situation, each script. The more I learn, the more I fell in love with acting. D: What are some of your favourite ways to live young? SL: I read a report once that to maintain a healthy lifestyle, one must have moderate exercise, a controlled diet and a mind free of worries. I shared before that I love to paint, write, exercise and read Chinese medicine health books as I enjoy a simple and natural lifestyle. I was reading the “Esoteric Scripture of the Yellow Emperor”, and there was a line that says, being innocent is man’s most precious gift. So whenever I am free, I will drive my kids to the nearby mountains and hills to play. I feel that nature and every untouched stone, grass, free from pesticide, water free from pollution are children’s best toys. When I am not working, I don’t put on make-up and I drink mineral water to hydrate myself. Replenishing ourselves with pure and natural water is very important, especially for women. From 1st September – 30th November, evian is running a social media contest where participants stand a chance to win a 4D3N trip for two worth up to SGD5,000 to enjoy the evian® spa at the six-star Signiel hotel in Seoul. To join the contest, consumers need to purchase a bottle of evian® natural mineral water, take a photo with the bottle, and share how they “Live young” with evian® on Instagram or Facebook with the campaign hashtag #evianOversizeSG.